This German-made permanent filter makes tea brewing a very simple task, whether at home or in the office. 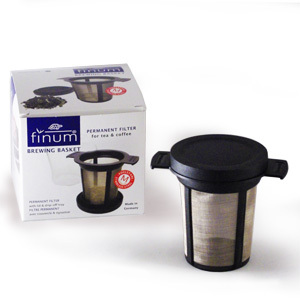 The filter is made with a durable stainless-steel mesh, which allows tea to drain quickly. The lid maintains a high temperature during steeping and then doubles as a drip tray when the filter is removed from the mug. At 3.5" x 4", it fits inside most cups and mugs. Heat-tolerant plastic handles make removal of the filter easy and prevent burning your fingers. Dishwasher safe. The Finum Brewing Basket is a “must-have” if you are a tea lover on the go.